After getting some feedback from my tutor, I decided to post an improved version of the same teaching sequence. This time you’ll see I included labels for the different stages and some further suggestions for the actual implementation. - I divided the teaching sequence into 4 main stages: prep stage, content-oriented activities, skills-oriented activities and focus stage. The prep stage is what Willis calls ‘The Pre-task Stage’. The content-oriented activities are activities in which the main aim is to work on the subject content; in this case, History. The skills-oriented activities are activities in which the main aim is to develop 1 or 2 language skills (i.e. listening/watching, reading, speaking and writing). Notice that both content oriented-activities and skills-oriented activities belong to what Willis calls ‘The Task Cycle’. Finally, the focus stage is what Willis called ‘The Language Focus Stage’. I chose a plain label for this stage because at this stage you can have Ss analysing and systematising not only language (lexis, grammar and phonology) but discourse, skills and strategies. I decided to focus on grammar, but I could have focused on discourse and had Ss analysing the genre, text types and information distribution patterns. - I included an assessment stage here and there as well. This is my own attempt to apply the concepts I’ve recently learnt in an in-service teacher training course. For the sake of time and space, I won’t discuss ‘assessment’ here but if you want to know more about my assessment planning decisions, post your queries and I’ll reply. - I used the word ‘activity’ because the word ‘task’ is biased towards thinking of TBL and/or CLIL, but I’ve noticed some teachers are not well acquainted with the difference between ‘task’ and ‘activity’ according to TBL and CLIL underlying theories. - I labelled each group of interconnected activities as ‘assignment’ (A-K). - I kept the label ‘task’ (1-6) to show the changes since the authors of the teaching sequence used the label ‘task’. - There isn’t balance between activities that require the use of ICT tools and activities that are more traditional. Hence, there’s a risk that students might get hooked on the tool and forget about the real aim of the activity. The ICT tool must be just a means to an end: learning the content, developing skills, and so on. For instance, as I modified the teaching sequence, my main aims were to introduce the use of e-portfolios in the English lesson, teach students how to use EVERNOTE and have them reflecting upon such an experience. - Then, we should try to strike a balance among activities that focus on content (of a school subject other than English Lg), activities that focus on the use of English (i.e. features of discourse, communicative functions, lexicogrammatical aspects, phonological aspects and language skills development), and activities that foster the development of thinking skills and learning-to-learn skills. For example, in the section ‘Focus on Grammar’, Assignment G, Activities 5.1.-5.5., there is a dramatic shift in theme. That is, the online interactive activities aren’t related to the French Revolution, but to literary narrative texts (anecdotes and short stories). I could have used the HOT POTATOES software here to improve these activities. Obviously, this would have taken longer. That’s why for the sake of saving time, I took a short cut here. - As I was making changes to the teaching sequence, I had a very particular class in mind. That is, a small group of student with a good command of the English language I taught at a state secondary school in the province of BA last year. As you can easily see, that teaching context was quite unusual. Otherwise, I don’t really think I’d ever teach such teaching sequence at all; not because of the complexity of the activities but because of the irrelevance of the theme. Sorry if this sounds rude to you, but this is my opinion. However, I can say no more because I don’t know a single thing about the teaching context in which the authors planned to implement their teaching sequence. - Please, do notice that I haven’t included any indications at all about how I’d divide the teaching sequence into 60-minute lessons. Obviously, each 60-minute lesson should start with a prep stage in which Ss review the previous lesson contents, preview the lesson contents, and activate (or build up) prior knowledge (about the theme, contents, etc.). Hence, at the points we decide to divide the teaching sequence into 60-minute lessons, relevant prep stage activities should be planned. Then, each lesson should ideally finish with a short revision of what Ss have covered so far. 1- Visit “World History: French Revolution Pictures” at Curiosity.com (Click http://curiosity.discovery.com/topic/world-history/french-revolution-pictures.htm) and choose 1 out of the 30 pictures of the French Revolution. Look at the picture carefully. You can read the caption under the picture to understand the meaning of the picture. TIPS: Take some minutes and look at other pictures carefully. Alternatively, you can google “french revolution images” and have a careful look at the pictures that turn out. 3- Open a new notebook on EVERNOTE: http://www.evernote.com/about/home.php. 2- Save your list in a new page of the notebook named “French Revolution” on EVERNOTE; you’ll need to use it later on. Name the page “French Revolution Coincidences”. TIP: Watch the video several times to complete this activity. 3- Save your answers in a new page of the notebook named “French Revolution” on EVERNOTE; you’ll need to use them later on. 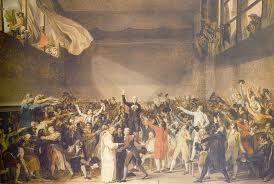 Name the page “French Revolution Main Historical Facts”. 2- What other sources can you consult? Surf the Internet to find reliable sources. Google “french revolution primary sources” and check out what turns up. 3- Include your mindmap in your presentation and save a copy of your presentation in a new page of the notebook named “French Revolution” on EVERNOTE. You’ll improve the presentation later on. Name the page “My View on the French Revolution 1.” You could choose a more creative title. 2- Revise and edit your timeline. First, check that you have included all the main facts in chronological order. Then, check that you have used the appropriate key words and expressions. Finally, check that you have used the correct narrative tenses. 3- Include your timeline in your presentation and save a copy of the improved version of your presentation in another page of the notebook named “French Revolution” on EVERNOTE. You’ll need to use this version of the presentation later on. Name the page “My View on the French Revolution 2.” You could choose a more creative title. 2- Take turns to give your oral presentation. As your classmates talk, complete the summarising form below. This form will help you remember the information you want to ask questions about when each speaker finishes.